I have an amazing nail polish collection to show you today from Zoya. 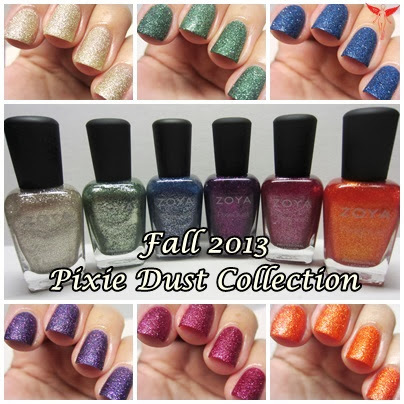 These 6 polishes are additions to the Pixie Dust line up. Here is two coats of each color on a clear swatch spoon. I have to admit, at first, I thought a few of these polishes were going to be dupes of earlier Pixie Dust shades. However, now that I've officially swatched them, I do see and appreciate the diversity of these shades from the others. My faves are Tomoko and Carter, but I really do love and am keeping each and every polish in this collection. Zoya's textured polishes are absolutely stunning, super glittery, and a must have in every polish collection. So what do you think of this collection? Will you be buying any of these? For more info on Zoya or to order these beautiful shades, you can use the following referral link and receive a FREE ZOYA POLISH!!! *special thanks to Zoya for sending this amazing collection for me to show to you.